Do you see anything copyrightable in the image that appears above? This is the question that was faced by the Massachusetts court in Real View LLC v. 20-20 Technologies, Inc. 683 F.Supp.2d 147. What do you think? This image is a classic example of the merger doctrine and the scenes a faire doctrine in the computeer software context. Here is how the court analyzed the image above under the merger doctrine, the scenes a faire doctrine and then as a compilation. One kitchen modeling software maker ripped of another's software. But was it copyrightable? Copyright conquered. And this decision vindicates an old theory of mine that the case law of the future will look like a comic book. Read this one, lots of helpful pictures. 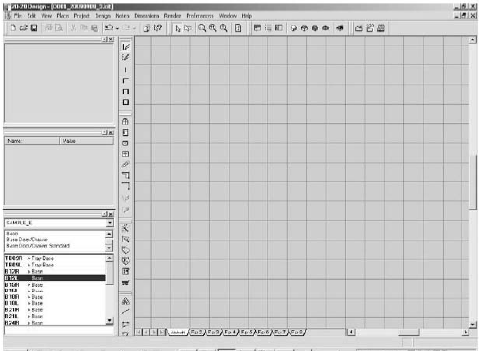 Further, there are very few locations on the screen that could accommodate the horizontal and vertical toolbars: the horizontal toolbar could only be placed above or below the work area, and the vertical tool bar could be placed to the right of the work area or on either the right or left side of the hierarchy of boxes. The doctrine of merger would therefore dictate that this Court filter out any claim of copyrightability based on the position of the toolbars. See Productivity Software Int'l v. Healthcare Techs., Inc., No. 93-6949, 1995 U.S. Dist. LEXIS 10381, at *15 (S.D.N.Y. July 24, 1995) (“[T]here are only two locations where a menu bar may be logically placed on a computer screen, the top and the bottom . . . . The limited alternatives available do not permit Plaintiff to claim copyright protection for its placement of the menu bar.”). The doctrines of merger and scenes a faire also preclude a finding of copyrightability with respect to the function and location of the hierarchy of boxes in the side bar. 20-20's own exhibit indicates that the screen displays of both Chief Architect and Planit contain similar stacks of boxes on one side of the screen. Since most of the screens are filled by the work area, the stacked boxes could only be positioned to the left or right of the work area. Thus merger denies copyright protection to 20-20's decision to position the boxes to the left of the work area. Moreover, since CAD software containing a sales component typically includes a product selection box (or boxes) along with a box that illustrates the item a user wishes to place in the kitchen, these features fall within the scenes a faire doctrine. This analysis, however, proves too much. Both the case law and the leading commentary warn against losing sight of the forest for the trees. See, e.g., Nimmer on Copyright § 13.03 (“In performing the filtering . . . the analysis should not proceed mechanically simply by isolating physical elements out of the copyrightable work.”); id. (“Although each geometric form in isolation might be subject to exclusion from the court’s calculus, the conceptual interrelationship of shapes should remain present for the court’s analysis even after filtering out particular concrete objects, thus subjecting the defendant to potential liability should copying of those elements be proven.”); Arnstein v. Porter, 154 F.2d 464, 477 (2d Cir. 1946) (Clark, J., dissenting) (“It is as though we found Shakespeare a plagiarist on the basis of his use of articles, pronouns, prepositions, and adjectives also used by others.”); Boisson v. Banian, Ltd., 273 F.3d 262, 272 (2d Cir. 2001) (“[A] court is not to dissect the works at issue into separate components and compare only the copyrightable elements. To do so would . .. result in almost nothing being copyrightable because original works broken down into their composite parts would usually be little more than basic unprotectible elements like letters, colors and symbols.”) (internal citation omitted). The fact that each individual icon or feature on a screen cannot necessarily be copyrighted does not deny the screen itself, as the sum of those icons or features, copyright protection. Thus the critical question becomes whether the screen display and graphical user interface are protectable as a compilation: whether the selection and arrangement of the icons, the layouts of the windows on the screen, and the dialog boxes which comprise the graphical user interface are themselves protectable as expression. In most cases, while the constituent elements of the user interface or screen display are not independently protectable, the user interface is protectable as a compilation with respect to its “unique selection and arrangement of all these features.” See Apple Computer Inc. v. Microsoft Corporation, 35 F.3d 1435, 1446 (9th Cir. 1994); Mitek Holdings, Inc. v. Arce Eng’g Co. Inc., 89 F.3d 1548, 1554 (11th Cir. 1996) (holding that “a user interface, here a screen display (itself an audiovisual work),may be entitled to copyright protection as a compilation.”); Engineering Dynamics, Inc. v. Structural Software, Inc., 26 F.3d 1135, 1346 (holding screen displays and input-output formats copyrightable and noting that their selection and arrangement contained enough originality under Feist to warrant protection). Cf. Feist Publ'ns, Inc. v. Rural Tel. Serv. Co., 499 U.S. 340, 348 (1991) (“[A] directory that contains absolutely no protectible written expression, only facts, meets the constitutional minimum for copyright protection if it features an original selection or arrangement.”). For example, one court protected the screen display, including the coordination,selection, and arrangement of fields, as a compilation even though the individual elements within the screen were unprotectable as unoriginal. See O.P. Solutions, Inc. v. Intellectual Prop. Network, Ltd., No. 96-7952, 1999 WL 47191, at *11-12, 20 (S.D.N.Y. Feb. 2, 1999). The inquiry must then turn to whether the screen display and user interface of 20-20 Design exhibit sufficient originality to be protectable under Feist. They do. The creators of 20-20 made numerous creative and expressive choices in developing the screen display and user interface. 20-20 selected certain functions to be represented by icons; certain icons to be represented in certain toolbars; certain toolbars to occupy certain spaces; and certain features to be housed in certain boxes stacked in a particular order. These may not have been decisions with much artistic sizzle, but they contain sufficient originality so that the screen display is copyrightable as a compilation. Real View v 20-20 Techologies: Scenes a Faire and Merger Doctrines Made Easy! From EFF - "Anti-Counterfeiting Treaty Is a Sham"